The Amulet of Samarkand is a children's novel of alternate history, fantasy and magic. 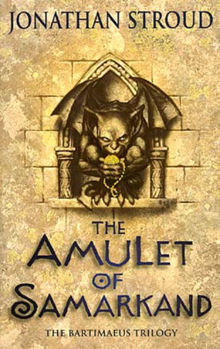 It is the first book in the Bartimaeus trilogy written by English author Jonathan Stroud. First edition (paperback) was published in Sept. 2003 by Doubleday in the United Kingdom. The book and series are about power struggles in a magical dystopia centred in London, England featuring a mix of current and ancient, secular and mythological themes. It is well known for its liberal use of footnotes to voice the lead character's sarcastic comments, as well as story background. The book is named for a magical artifact created in the ancient Asian city of Samarkand, around which the story revolves. A magician's young apprentice, Nathaniel, summons the irascible 5,000-year-old djinni, Bartimaeus, to do his bidding. Nathaniel has an interesting assignment for Bartimaeus: he must steal the powerful Amulet of Samarkand from Simon Lovelace, a master magician of unrivalled ruthlessness and ambition. The only problem is Bartimaeus couldn't care less for what his current master really wants, only that he has a job to complete (and survive) before he can return to "The Other Place" again... that and perhaps get even with the annoying little brat who summoned him if he gets the chance. Bartimaeus refers constantly to his relation with his former master Ptolemy, comparing him much more favourably to Nathaniel. Before long, Bartimaeus and Nathaniel are caught up in a terrifying flood of magical intrigue, rebellion and murder. Nathaniel learns quickly that he may have gotten into a plot much more in depth than he and his djinni can cope with. Amulet of Samarkand, so named for ancient city of Samarkand, Uzbekistan, where it was forged; it grants the wearer immunity to magical attacks. In an alternate London where the British Empire dominates the world through control of magic, and commoners are governed by the ruling class of magicians, five-year-old Nathaniel is sold into the apprenticeship of magician Arthur Underwood, Minister of Internal Affairs. Despite Underwood’s disinterest, his wife Martha welcomes the child. By age ten, Nathaniel has received a classical education and insight into magicians’ power: magic is performed by a hierarchy of otherworldly spirits that magicians, with adequate knowledge and willpower, can summon and bind into service. Nathaniel is presented to a gathering of magicians including the formidable Simon Lovelace, who dismisses Nathaniel’s obvious talents and humiliates and beats him; his favorite teacher Ms. Lutyens tries to intervene and is fired. Embittered toward Underwood, Nathaniel studies advanced magic in secret and plots revenge on Lovelace. Through a rudimentary scrying glass, Nathaniel sees Lovelace receive a package from a bearded mercenary, the powerful Amulet of Samarkand. Days after his twelfth birthday, Nathaniel summons Bartimaeus, an ancient and cocky djinn who resents his enslavement, and charges him to steal the Amulet. Retrieving the artifact, Bartimaeus barely escapes Faquarl and Jabor, two of Lovelace’s djinn, and is accosted by a mysterious gang of youths who attempt to take the Amulet; they are later revealed to be the Resistance, working to undermine the magicians’ rule. Bartimaeus is ordered to hide the Amulet in Underwood's study, and overhears his master’s birth name "Nathaniel," which provides him a defense against punishment from the young magician, but he applies a spell to guarantee Bartimaeus’ servitude for one month. Later, Nathaniel is officially named “John Mandrake” and accompanies the Underwoods to the state address at parliament. At the gathering of high-ranking magicians, a Resistance member causes an explosion, resulting in several injuries. Bartimaeus, ordered to spy on Lovelace, travels to the magician Sholto Pinn’s curio shop. He learns the Amulet had been under government protection before his cover is blown, and he is detained in the Tower of London. Underwood discovers and confiscates Nathaniel's summoning paraphernalia, and is called to the Tower to interrogate Bartimaeus. When Underwood returns, Nathaniel uses the scrying glass but is caught. At the Tower, Bartimaeus is unsuccessfully interrogated by Pinn and Jessica Whitwell, Minister of Security. With the help of Jabor and Faquarl, Bartimaeus escapes, on the condition that he reveal the location of the Amulet and his master. Bartimaeus flees, unwittingly leading Lovelace to the Underwood house. Lovelace, who plans to use the Amulet to seize control of the government, threatens Underwood and discovers the Amulet in his study. Nathaniel reveals himself as the thief, but his master encourages Lovelace to kill his apprentice instead of him. Lovelace’s spirits destroy the house; the Underwoods perish but Bartimaeus saves Nathaniel. Vowing to avenge his beloved Mrs. Underwood, Nathaniel promises to free Bartimaeus when their task is complete. After encountering the Resistance, Nathaniel and Bartimaeus travel to Heddlehem Hall to stop Lovelace's coup. There, Bartimaeus battles mysterious bearded mercenary, who displays extraordinary resistance to magic and a pair of seven league boots. Nathaniel is discovered by Lovelace and his master Schyler, who offers an ultimatum: to join Lovelace’s new order, or die. Nathaniel manages to kill Schyler using petty magical firework-cubes, and he and Bartimaeus arrive at the conference of magicians. Nathaniel attempts to warn the attendees but Whitwell, ignorant of the plot, places him in an impenetrable bubble. The room is revealed to be an enormous summoning pentacle – Lovelace, shielded by the Amulet, blows an ancient horn to call forth the immense spirit Ramuthra, who destroys the surrounding magicians and spirits. Bartimaeus distracts Lovelace, allowing Nathaniel to seize the Amulet. Ramuthra obliterates Lovelace, and Nathaniel delivers the words of dismissal and breaks the summoning horn. Ramuthra disappears, and Nathaniel presents the Amulet to Prime Minister Rupert Devereaux. Recounting a modified version of events, Nathaniel becomes the quiet hero of the government. He strikes a bargain with Bartimaeus: in return for keeping Nathaniel’s true name a secret, the magician will not summon him again. With Bartimaeus’ grudging respect, Nathaniel unbinds him, beginning a true magician's life under a new master, Jessica Whitwell.